*Please note: Our Wiki has had a face lift since this video was made, however much of the functionality is the same. See screenshots below for the new Wiki. This article describes how to configure and use the Wiki section. Click here for some great ideas on how to use the Wiki. The Wiki feature adds a very powerful knowledge management capability to TeamSupport. You can collaborate on articles which include images and documents that can be shared internally in your organization, externally via the Hub, or to the entire world. The most basic definition of a wiki is “A website or similar online resource which allows users to add and edit content collectively.” What does collectively editing mean? Simple – If you write an article for the wiki, and someone else finds a problem with it, they can change it directly in the wiki. This means that you will no longer have stale or out of date documents. Another key tenant of a Wiki is that all changes are logged, and you can go back to a previous version of the document at any time. If you don’t agree with the change that someone made to a document, or you simply made a mistake, just edit the document and select a previously saved version. The wiki keeps a complete track record of every change ever made to the wiki, and lets you go back and resurrect those versions whenever you want. A wiki also lets you work together as a group on a document. Instead of e-mailing versions of documents around, you can simply use the wiki to edit the document. Another power feature of the Wiki is that you have the ability to report against Wiki content and settings. 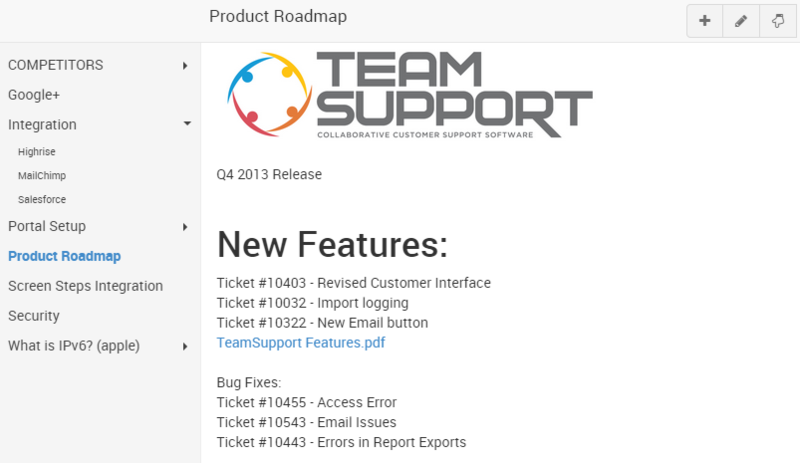 This page will cover how to use the Wiki Section of TeamSupport. Click here to learn how your Customers will use Wiki from your Customer Hub. You will first need to enable Wiki for use on your Hub. To do this, go to Admin->My Portal->Customer Hub Settings-> and enable “Wiki”. The navigation on the left side allows you to quickly find the article you are looking for. Articles can be nested as many levels deep as you want so it is easy to put documents in their correct categories. Simply clicking on a document on the left will bring up the current version of that document. To create a new wiki article, just click the Create Wiki Page (+) icon, and to edit the article click the pencil icon in the upper right of the screen. 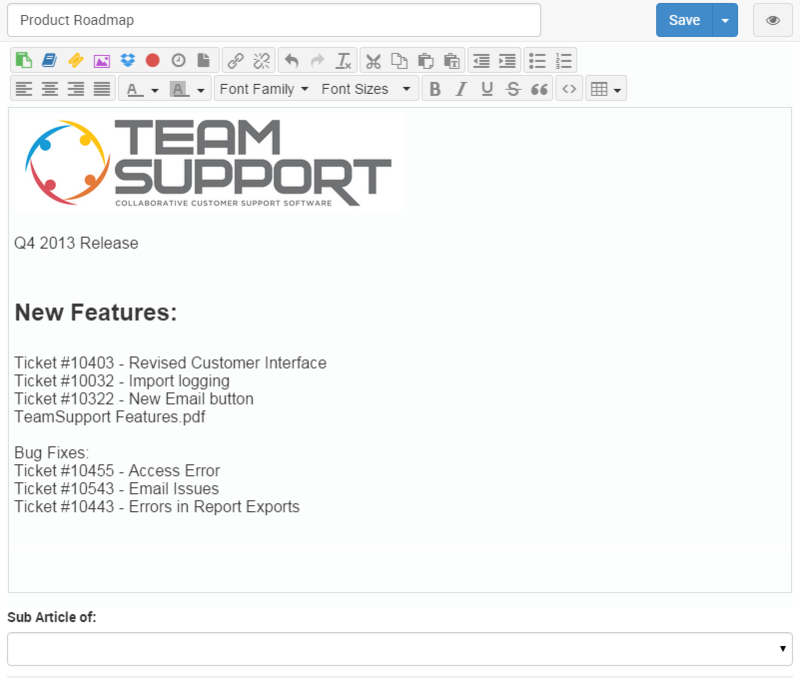 This screen lets you edit the document in a format similar to elsewhere in the TeamSupport application. Most of the editing buttons should be familiar to users, but there are a couple of unique ones for the wiki. Save/Edit/Delete : The upper right hand button has the Save button, with Edit and Delete as a submenu. When you save, you will be prompted to add an optional comment. Privacy Settings : Click here to learn more about Wiki article privacy. Click here to learn about the buttons that can also be found on ticket actions. Insert Wiki Article: One of the most powerful features of a Wiki is the ability to link from one article to another. The insert Wiki Article menu will allow you to select from any Wiki article to insert a hyperlink to that document. Hyperlink/Document Manager: Insert a hyperlink into your document. This button also allows you to access the Document Manager. Insert Table : The button allows you to add a custom table to your Wiki Article. Sub Page of : Here is where you indicate the hierarchy of your Wiki articles. An article with None as the Sub Page will be a top level article. A note regarding privacy and sub-articles on the Customer Hub: A sub-article will inherent the privacy setting of it’s top-level (or parent) article. For example, if a sub-article is public, but it’s parent article is private, the sub-article will not be displayed on the Customer Hub. In order for a sub-article to be displayed, it must be marked public and it’s parent article must be marked public. Previous Versions : As mentioned above, every version of every wiki article is stored, and the list on the bottom shows each version, the time it was saved, and any comments that were left by the user. To go to one of these versions, simply click on the preview button for this version and it will be displayed in the edit pane.